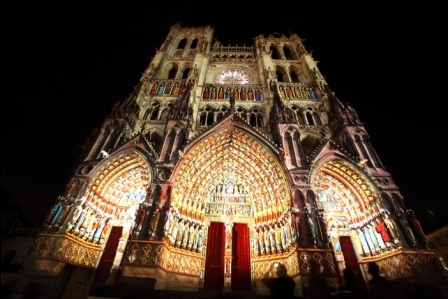 Did you know that the Cathedral of Amiens is the largest Gothic cathedral in France? It represents twice the volume of Notre Dame Cathedral in Paris, just to give you an idea! You’re sure to be impressed by the splendor and dizzying height of the cathedral facade when you arrive at the front courtyard. Your children will be amazed by all the small details that form a harmonious whole: gargoyles, angels, multicolored rose windows, etc. You’ll dive head first into the time of the cathedral builders. Welcome to the novels of Ken Follet! When you enter the nave, an impression of immensity overwhelms you. The octagonal labyrinth formed by the ornamental tiling is an invitation to discovery. The smell, the silence and the light seem to offer you a fabulous journey through time. And there’s an extra! From June to September and during the month of December, colored lights are projected on the facade to show the polychrome appearance of the cathedral in the 13th century. Discover this enchanting spectacle free of charge! The Cathedral is open all year round for free visits from Tuesday to Sunday. The Amiens Tourism Office makes it possible to rent an audio guide. Guided tours for a fee can be organized with a guide and are by reservation only. We strongly recommend visiting the towers for a grandiose view of the city of Amiens from 100 meters on high (entry fee). The Cathedral houses the holy relic of the reputed skull of St. John the Baptist, which was said to have been stolen by Crusaders during the sacking of Constantinople in 1204. The mystery has never been solved!